Giving back is something that I’ve always advocated, because I believe that it gives life both meaning and purpose. In the case of photography, I typically do that by means of teaching, writing these blog posts, and occasionally shipping myself into boxes to surprise sick fans. About a year ago, I did something different. I flew over to help make a viral video to attempt to save a (then) 4 year old little stranger called Eliza O’Neill, suffering from a terminal degenerative brain disease called Sanfillipo Syndrome. As a result, Ivan Makarov who runs the charity Photographers for Good, reached out to me a couple months back, offering to donate a 100% of profits from a fine art book – The Plus One Collection III, featuring work from over 200 photographers in the world (including yours truly, of course!) – to the Cure Sanfilippo Foundation. Whilst the fundraiser was active though, Ivan asked if I would be willing to auction off a photoshoot or two to help generate a few additional sales – I didn’t think much of it and immediately agreed. 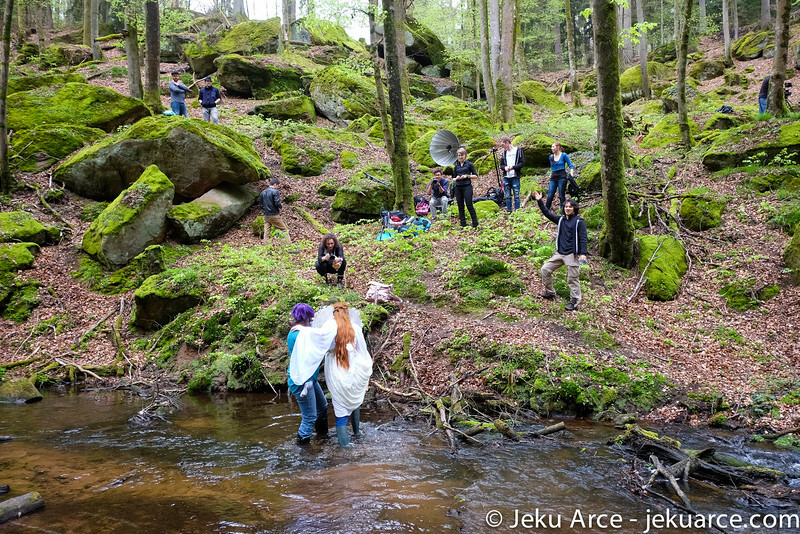 And that… is how I ended up in Germany, doing my first ever maternity photoshoot for a lady I met on the internet. This project took place right in between some of my largest campaigns ever – a smartphone fire shoot with Huawei in Shanghai, along with an underwater fisherman shoot with Ballantine’s in Mexico. This meant that I would have all the challenges of a typical shoot, crushed in between the endless calls, emails and meetings across multiple time zones in a variety of different languages of the advertising world. On top of that, Eva didn’t want simple. She wanted complicated. “Magic! Costumes! Fantasy! Surreal! Animals! Castles! ” were a couple words that gushed from her fingertips as we slowly started to conceptualize her dream shoot, transforming an idea into reality – making our very own Stone Soup. This project was truly brought to life by members of the local community in Kaiserslautern – fans and friends of Eva that were thrilled to come along with us and create the most fantastical images we possibly could with the resources that we had available. Broncolor Germany graciously loaned me a Para 88 along with a couple extra lights, whilst Eva started messaging designers she had found on facebook, Au Contraire and Fairytas, to see if they were interested in participating in the shoot with us. Simultaneously, one of Eva’s friends Karin Stumph went on the hunt to source the most exotic animals we could find – resulting in a pair of wolfhounds, spotted whilst taking a walk, as well as a couple Owls from the local zoo. 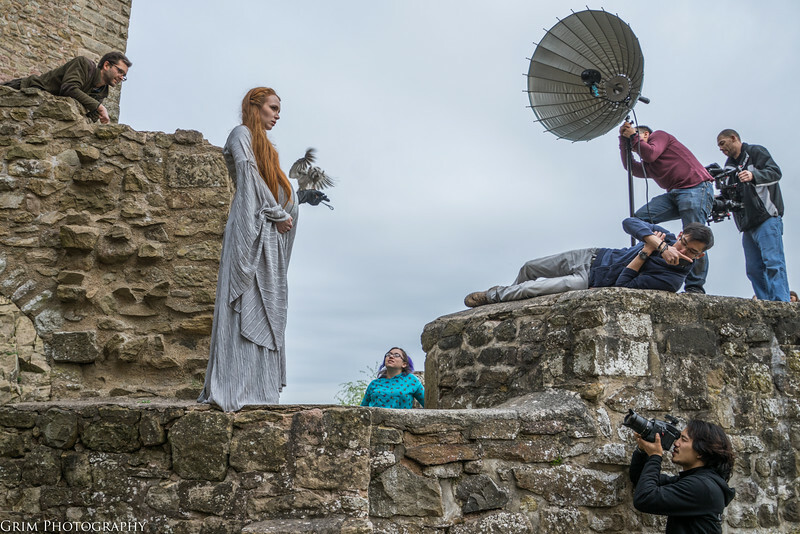 Eric Clayborn, a local videographer, also offered to make a Behind the Scenes video chronicling the adventure whilst Florence Hayer FX, hair & makeup artist I met in Cologne over a year ago hitched a lift all the way down to bring the shoot to life. The result: A huge team of people, gear, clothing and equipment scattered across the serene but beautiful landscape of rural Germany. There was a slight irony in what we were about to create. A contrast, between the life that Eva would be bringing into the world and the hope of life that Eliza was currently fighting for. Something to infuse into our images – a beautiful blend of strength and hope against a backdrop of melancholy and darkness. All that remained was to create them. Despite having some of the most amazing lighting and camera gear that exists in the industry, coming up with the perfect shot always means a little bit of improvisation – from having Edward and his e-cigarettes play the role of human smoke machine – to being precariously balanced on a small step-ladder stabilized by three people to get the perfect angle. 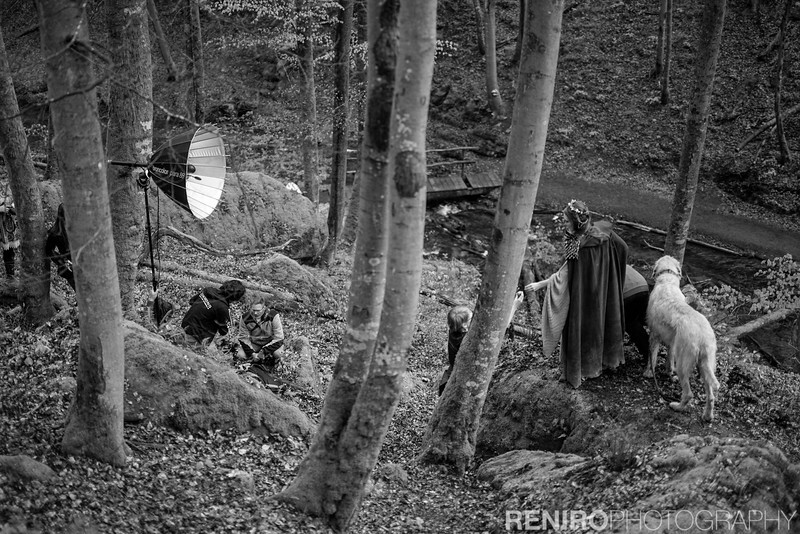 Lighting for the shots were kept fairly simple, using an unfocused Para 88 as the main fill light and the Sun, bleeding through the clouds and trees as a backlight while using the Mamiya Leaf’s leaf shutter to control how much ambient light would bleed into the shot. Funny enough, the greatest challenge was navigating the slanted terrain to find the best location to set-up the lights, models and animals so that all would be comfortable enough to stay still for the shot that we wanted to create. Once done with the wolfhounds, we headed over to the closest castle to meet up with Alan Redzpovic who was rushing over from the Kaiserslautern Zoo to make the shoot, just in time for sunset, with a couple of his owls. For the first image, we chose to shoot in a wide open field complete with a classic european sunset in the backdrop as Eva carefully held one of the owls in her gloves. Getting everything into the perfect position looked a little less glamorous with Eva balancing carefully on a step ladder, a massive Para 88 blasting her face from just a couple feet away and Aalia lying on the floor, tossing the cloak to give it just a little bit of movement on a 3-2-1- count. From there, it was just a question of coordinating owl, sun and flash to get the perfect shot. With the sun rapidly disappearing into the horizon, we scrambled into the castle to snag our final dramatic image of Eva standing tall within the walls of the castle. Timing the final shot was extremely complicated as we had to synchronize the release of the owl from Alan’s hands, hiding behind Eva, the shutter lag of the Credo 80 and the perfect angle of flight so that he wouldn’t be hidden behind Eva’s raised arm. A single Para 88, to make her pop out of the backdrop while the shutter was dragged just a little bit, to help bring out the clouds in the background. Creating beautiful pictures is quite challenging on its own, but one of the things that I’ve been obsessing over recently is to create images that have meaning and purpose. This series, to me, is the perfect example of using my photography to help transform the lives of others into something better. To make someone’s dream come true while simultaneously supporting another’s hope for life. Finding a balance between teaching, creating and making a living is always a delicate dance but I have found, with time… that you cannot afford to skip out on the projects that feed your soul. 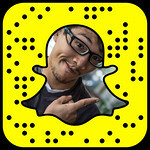 I’ll be speaking in Seattle at Pix2015 this Tuesday : www.pix2015.com/speakers/benjamin-von-wong It’ll be live streamed too!